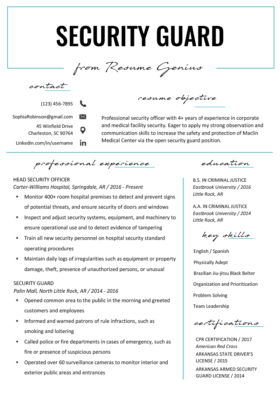 Check out our downloadable resume sample and expert writing tips to create a police officer resume that’ll set you apart from the crowd! Straight-up: It’s not easy to land a job as a police officer. It’s a demanding job with an extensive application process. You’ll be facing a number of challenges along the way — don’t let your resume be one of them. Promotions are described in lots of jobs as “moving up in the ranks,” but a career in the police force is one where you actually do attain higher ranks as you gain experience (if you do it right). Guidelines and minimum requirements for promotion will vary from state to state, so you’ll want to know what promotion looks like in your particular area. When you’re writing your career objective, shape it to resemble the next rank you’re aiming for as closely as possible. This means you’ll want to hit the skills, experience, and character traits that your superiors are looking for to move you up the ladder. In general, moving beyond the ranks of patrol officer is all about displaying qualities of leadership; experience comes with time and skills are learned as you go, but not everyone has the character traits that make a great leader. If you’re interested in moving up in the ranks, consider taking some leadership courses online or in-person. As well, reading some leadership books will also help you with the kind of language you want to use on your resume to describe yourself. Being a police officer is a very “real” job; generally you start your career in tough, intense environments that are as real as it gets. Underneath each job position listed in your professional experience, you want to list a few key activities and achievements that are notable to the reader and give them an idea of your experience on the frontlines. In this section you want to avoid listing bullet points that simply identify basic job functions, and instead focus on specific achievements that show your level of competency. For example, saying: “Issued tickets to violators of local laws“doesn’t tell the reader anything more about you as a police officer than they would have already expected, and is therefore a waste of valuable space on your resume, and their time. On the other hand, saying something like “Initiated community & gang outreach program with former gang members to reduce youth membership in street gangs” tells the reader a ton of information about you. It highlights your commitment to leadership in the community, that you value connecting with young people, and that you are experienced in dealing with dangerous environments and people. Your choice of action verbs will depend on the activities or achievements that you choose to highlight. You want to use action verbs because they present the reader with a picture of you as someone who does things, rather than just a list of job duties. There are also many ways to communicate one idea using different action verbs, which allows you to add some spice to your resume. Want even more? Check out The Longest Action Verb List In The Universe. If you have a lot of skills and experience, the education section on your resume is less important as far as details go, but still necessary to indicate you have attained at least the minimum educational requirement. If you are short on experience and looking for an entry-level position, you may want to highlight things like grades, awards, and so on. As you update your resume as your career progresses, these become less relevant and can be removed. If you’re aiming for a more specialized position within the police force, like the forensics department, you’ll want to highlight your specific training and any advanced certifications in this section. Continuous skill development will make you a much more attractive candidate for promotion, and this section is one that can really help separate you from other candidates, both in terms of the kinds of professional development you pursue and in your commitment to improving yourself. Also – if you have language skills, be sure to highlight them in this section. Urban areas especially are more diverse than ever, and speaking the language of a minority group of significant size may very well be the difference between getting hired or not. If you don’t have a second language under your belt, it is strongly recommended for police officers in particular because of the importance of clear and trustworthy communication in your field. Did you find this guide helpful? Let us know in the comments below! We’re glad you think so.